I employ the label "prophecy inventors" because I don't believe in inventing or repurposing existing Bible prophecies to create private prophecy theories (2Pt 1:20) loosely based on Scripture. I believe in sticking to the few end sign time prophecies that we have and taking them at face value, literally  such as Mt 24:14. No need to invent anything when you value the end time prophecies we already have. Unfortunately, I'm in the minority to use this literal approach consistently, hence the epidemic of prophecy theories of this decade. To properly interpret any prophecy, we need to ask first what is the original context of it? Jeremiah 25 talks about the punishment of ancient Judah for 70 years of exile in Babylon (Iraq). Because Judah did not keep the Sabbath year land rest command  a total of 70 times, they were exiled for 70 years of captivity in Babylon. After 70 years, they were allowed to return to Jerusalem, starting under Cyrus. Benjamin Baruch has a new twist on this old, already-fulfilled prophecy. He claims an inspiration from God that the 70 years of slavery banishment also applies to modern Israel with "America the Babylon"  serving as the new "Babylonian" captor of Israel. Modern Israel, as we all know, was reinstated in the year 1948 when Israel declared their independence (May 14). This is not to be confused with the United Nations Partition Plan for Palestine resolution of November, 1947 which other theories listed above based their theories on. It's true I don't like invented theories. The reason is because they keep believers from focusing on the, less-sensational, but true and critical real prophecies (e.g., Mt 24:14). But, I do like Benjamin Baruch . I found him through the Prophecy Club  in 1999. I watched his video and bought his book the Day of the Lord is at Hand. It is still, to this day, the most helpful prophecy book I have found. I owe several ideas shared on this site and in my book Know the Future  to it, such as the 144,000 going two by two . 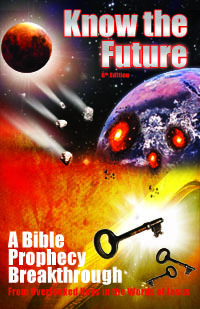 (I was so taken by it that I set up my first prophecy website to publish Baruch's book online for others to read.) I even met him in person while still living in Costa Rica (from 1999-2014) through a mutual friend Shannon "Omegaman Radio" Davis. While The Day of the Lord is at Hand had many great insights, it unfortunately fell into the old trap of inventing reasons for attaching dates to end time events (as opposed to using existing reasons for narrowing down timing like the Sabbath year cycles ). Baruch stated in the 2nd edition of his book on page 235 and 236, "The Lord has revealed several things about the coming judgement upon America:"
"America as we know it is over, and will not survive to the year 2007"
"Civil war will come to America at the beginning of the judgement." "The east and west coasts will be destroyed by nuclear fire." "Biological weapons will be used in the other major U.S. cities." "The U.S. will suffer a staggering loss of life in the tens of millions." Saldy (or thankfully?) those statements did not prove reliable. I have dug up this embarrassing history not to shame or mock B.B., but rather to help others to see like the Bible instructs, Baruch as a prophet is not someone to "fear" or "respect" when it comes to his pronouncements compared to a confirmed prophet of God  (Dt 18:22). I'm sure Benjamin means well and believes what he's sharing. Self-deception happens to the best of us because of confirmation bias  and other cognitive biases. So far it has happened to every single prophecy inventor in history. They believed they found a genuine insight into the future that others had missed only to find out that they saw something nobody else saw because it was a creation of their own mind and its biases. Given this unfortunate track record, I cringed upon learning Benjamin had invented a new prophecy theory due so soon. As is typical, a reader shared a link to it and asked me for my opinion. That's why I wrote this article and just about all the debunking articles I share. The 70 years of Israel’s slavery (Jeremiah 25) is repeating within the destiny of end time Israel which has been in slavery spiritually. The rule of [America the] Babylon over the nations is also co-terminus. Two messages worth reviewing … these prove 2018 is indeed WW3. Jeff Nyquist told me on the same day I got this word from Jeremiah 25, that one of his contacts, who is friends with Victor Suvorov, author of Spetsnaz, confirmed Suvorov is certain that the Overture has begun and WW3 will come at some point in 2018. What he's saying is plain: America falls in 2018 (or 2019 or 2020 as he stated in the interview I was sent to listen to by a reader) because the 70 years of America ruling over Israel since 1948 have ended. World War 3 brings the end of America. That's a bold prediction that may scare some of you. After all, you can't dispute the math that 1948 + 70 = 2018. What if he's right? Problem #1 - America is not Iraq, Israel is not in America, Captivity or "Slavery"
Thankfully, there are many simple, obvious problems with his 2018 theory. Like most invented prophecy theories, it seems Scripture-based and "legit" as long as viewed inside a vacuum, or in isolation from related prophetic passages. These theories "don't let the facts get in the way of a good story," as it were. The first problem I would point out with this theory is that Jeremiah 25's subject and context is ancient Israel in ancient Babylon. This is a well-known prophecy with a clear fulfillment. Moreover, there is nothing to indicate it is a dual prophecy about modern Israel and modern Babylon. This is possible, but is speculation with no internal evidence outside a private word of God Benjamin claims to have. Worse, modern Babylon is not America; it's Iraq. America is indeed called Mystery Babylon the Great in Revelation 17-18, but that's not the same as plain Babylon which also appears in end time prophecy to tell us what will happen to Iraq (Isaiah 13-14). The "mystery" adjective tells you it's not the Iraq Babylon existing to this day. What Baruch is doing is not only reusing the prophecy for his new prophecy invention, but also radically modifying the plain subject of the given prophecy from Iraq to America. Importantly, Jeremiah refers to America in later chapters 50-51. There he calls America "Daughter Babylon" in association to her "mother" nation as well, the United Kingdom. Jeremiah makes no mention of Daughter Babylon in Jeremiah 25 to indicate there is a dual fulfillment with an end time America Babylon. This means there is no grounds to apply Jeremiah 25's Babylon to America/Daughter Babylon in the text itself. Finally, Baruch is also playing loose with his "second fulfillment" of Judah's captivity in Babylon; very loose. The State of Israel since 1948 has been the very opposite of "Babylonian captivity." They have been in their own land at last. He says they have been in "slavery" in their own land to "America." Seriously? If they are in slavery then so is every other nation in the world since everyone feels they work like slaves and get slave pay. Yes, Israel is under persecution and in conflict, but that has been their story since the beginning. Now they are in their own land, which is quite the opposite of being in captivity. They are free and independent, unoccupied and sovereign. If Bible prophecy is to be interpreted so that "freedom is captivity" and the ex-captor of Israel is now someone else who Israel is not in captivity to anyway, then we might as well not even quote Scripture to support our revelation from God. Just call it a revelation from God on its own. As explained above, the 1948 + 70 = 2018 calculation for America's destruction in WW3 is based on radically twisting the key subjects of Jeremiah 25 to make it fit modern Israel's non-captivity situation and America's non-captor/Babylon role. This means the 2018 date calculation for America's destruction is just an interesting-sounding contrivance. That's not to say America will not be destroyed . It will be according to Revelation 18. It just won't happen in the year 2018 (or 2019, or 2020). Revelation 18:4-5 — Then I heard another voice from heaven say: “Come out of her, my people, so that you will not share in her sins or contract any of her plagues. 5 For her sins are piled up to heaven, and God has remembered her iniquities..
Jeremiah 51:45 — Come out from among her, My people! Save your lives, each of you, from the LORD’s burning anger. And lest your heart faint, and ye fear for the rumour that shall be heard in the land; a rumour shall both come one year, and after that in another year shall come a rumour, and violence in the land, ruler against ruler. Jeremiah and Revelation agree on the call to leave going out before the destruction. John heard the voice from heaven directly, but on earth heavenly messages are only delivered to the masses by prophets. (Only a few people at a time have ever been graced with angelic delivery of messages.) Jeremiah includes the detail that this warning or "rumor" goes out for two years before the "rumored" violence in the land comes to pass. If you are not already familiar with these passages and this coming warning, see my previous articles that go into depth on the subject. I say that the warning to flee America will be unmissable. I think the authenticated end time prophet Elijah will be issuing it . The world has never seen a certified, sign-working prophet like Biblical prophets were. (Even John the Baptist who "did no signs" was certified as a prophet to all by his special birth and lifestyle.) Elijah will be special in that regard and distinct from past "Christian prophets" who are hit or miss. Mostly miss. But that does not mean that the warning will be unmistakable. Most Christians will not like "this Elijah guy" very much because he will come with very radical, hard-to-receive teaching. He will not just relay the radical instruction that you need to give up your home and life and move to the one safe place God has chosen; a place which by the way is located in post-nuclear war Israel  (Jer 51:50, 49=Mt 24:16=Joel 2:32). He will also issue teaching on genuine repentance or obedience to what Jesus said to do  as well, in fulfillment of Mt 24:14 the end time precursor sign of the return of the Gospel of the Kingdom . Frankly, I think most Christians will readily mistake Elijah for a kook and reject his life-or-death instruction on fleeing home. It's an easy mistake to make with someone telling you something you don't want to hear. Hearing someone say your Christian repentance and salvation are counterfeits of the genuine teaching of Jesus and you are not going up in a pretrib rapture will be quite a buzzkill for Christians. Our reflex is to ignore crazy-sounding, negative news. However, that first reaction will only last until people see this second event before America's destruction: the unmissable, unmistakable departure of the faithful saints to the place we are called to go to: Judea . I imagine most saints will be leaving towards the end of the two years, given procrastination and wanting to convince loved ones to come with them. Once the doubters see in the second year of the warning how many people—including those they know—are really listening, giving up all and leaving, they will begin to reconsider the warning they at first scoffed at. The old FOMO or "fear of missing out" and even sheep instinct biases will kick in and help them make the right decision, even if it's not in pure faith. Given just the two missing events above, not only is 2018 impossible for America's fall, but so is the outside date of Baruch's wide goalposts of 2020. We would already be in the two years of warning to flee America if a 2018-2020 timeline for America's destruction were correct. Also we would be experiencing the worldwide publication of the Good News of the Kingdom, the gospel that Jesus taught, but Christianity never has. Christianity's counterfeit "gospel" is one of the things Elijah will be teaching against that will definitely rub Christians the wrong way. Please see my supporter study on that to get a heads start on adjusting your thinking on that subject . All due respect to Benjamin Baruch, but he missed it again with his latest date setting. In my experience because he's basing his prediction off a reinvention of a fulfilled prophecy, there's no need to wait until 2020 to be certain of that. That is my opinion after hearing his prophecy in conformance with what Paul said to let the prophets speak and the others judge (1Cor 14:29). Thank you for reading and special thanks to those who join my support team  to access the studies referenced above. You, along with those who buy my book to get the full understanding not contained in the free articles , are making it possible for me to continue sharing free articles like this. God bless you all.